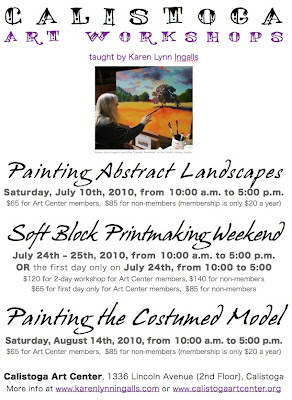 I'm looking forward to next week's Soft Block Printmaking workshop (either a one-day workshop on Saturday for those who want to try this out for the first time, or a full weekend workshop for those who want to really plunge into all the things you can do with this medium). 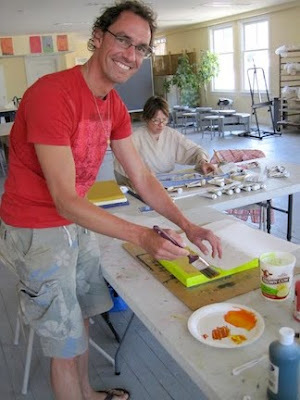 If you have done linoleum or wood block printing before, this is a little different. Soft blocks are made of new materials created in recent years. They cut like butter, and their ease of cutting makes it a much more enjoyable process (for me, anyway). The ones I recommend are Speedball's Speedy Carve blocks – the pink ones in the stack below. In addition, Speedball, a printing supplies company, invented safety cutters – called LinoZips – that are easier to hold and to manipulate, and that create beautiful curving lines with much more ease. 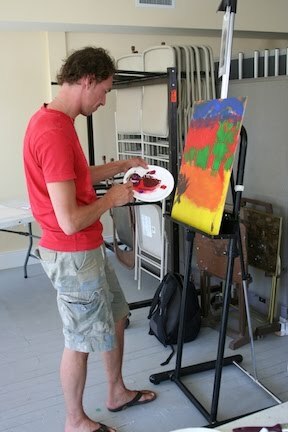 Besides that, we're using water-soluble inks – so there's no solvent smell. Ain't technology wonderful? Each of these things has made the block printing process simpler and, for me, a lot more fun. The first day will be about getting your design on the block, and carving the block and printing it. For those who are interested in printing more than one color, we'll get started on different methods of doing that, too. The second day, we'll continue with different methods of printing multiple colors, including hand coloring, reductive printing, and using a key block. 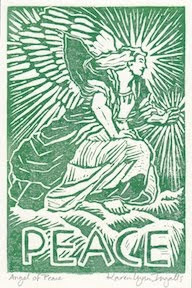 We'll also do a little block printing on fabric, so be sure to bring things you'd like to print on (cotton shirts from consignment or thrift shops, pieces of old sheets (for experimentation and something special! ), white dish towels, canvas tote bags, T-shirts, or...? 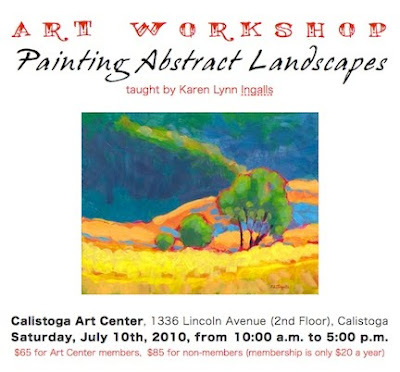 You can register online at the Calistoga Art Center's workshop page. 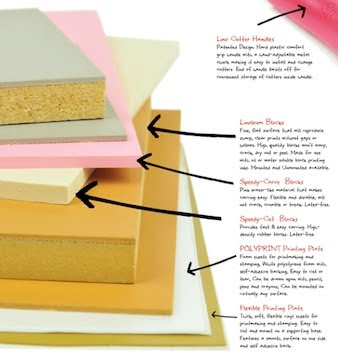 If you'd like me to supply your materials, please give me a call to let me know in advance at (707) 942-0197. Wonder what you missed in the Abstract Landscape Painting workshop? Here are some photos, taken by Erik Bolijn and myself. 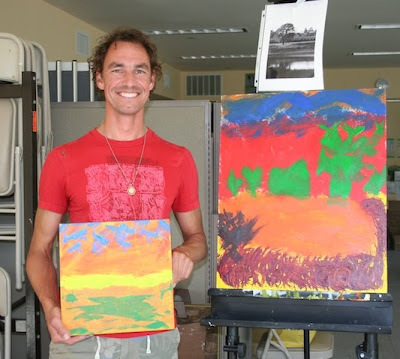 We took three different approaches to painting the landscape in an abstract manner. 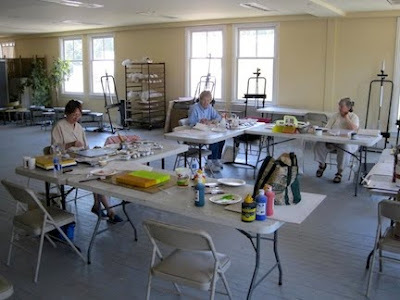 Here, everyone is working on the first one. 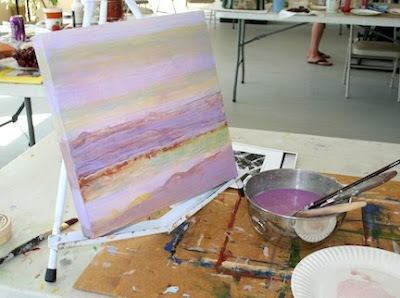 Painting abstract landscapes is a wonderfully freeing thing. We began with ideas or memories of images, or the images of the landscape themselves, but in abstracting it we're free to take the painting in directions we (and it) want to go. We're not tied down, and we don't have to get wrapped up in detail. Here is the beginning stage of my second demonstration painting. And here are some of the results. Pat had to leave us early, and hers unfortunately aren't included. 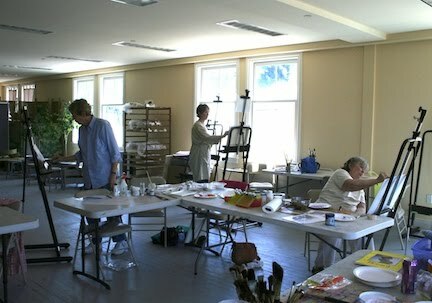 Some of these may be completed – and some may still be in process. Creativity is a wonderful thing – we had a great day of it! Here's to creativity and taking images, ideas, feelings, and sensations to new places! I'm settling down after the weekend's excitement, what with the county fair and Calistoga's Fourth of July parade (the Silverado parade - it was great! 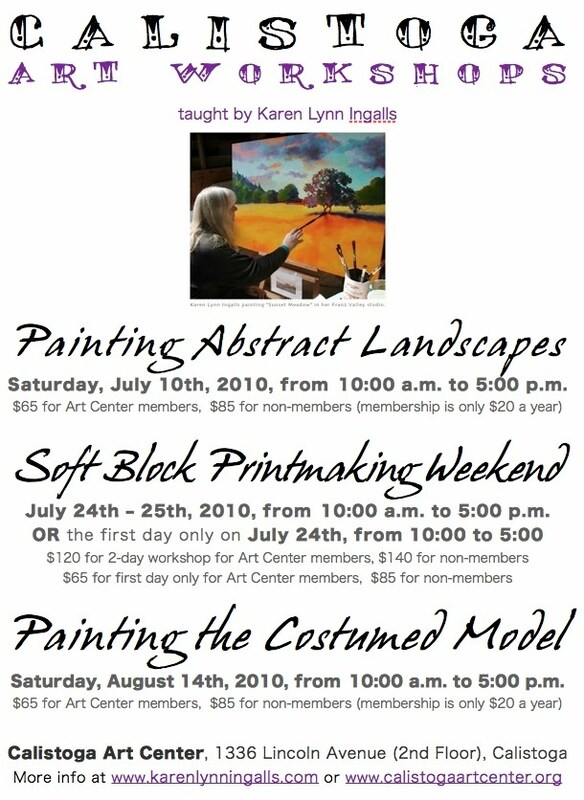 ), and looking forward to this coming Saturday's painting workshop. I've got a lot to pack in to the time, so it will be a full and fun day. We're going to look at several different artists for inspiration – artists who begin with the landscape as their inspiration, but who take it in very different, and abstracted, directions. 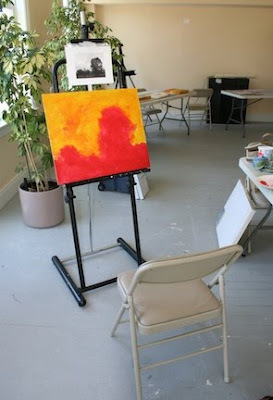 Then we'll take three different approaches to abstraction, trying them out for size. It's a good way to experiment and find out not only what interests you the most, but find out what approach feels best to you. Are you wondering which artists we'll be looking at for inspiration? If you're familiar with my classes, you may recognize some of them. But you may not have seen the work of Tina Mammoser, an American artist living and working in England. 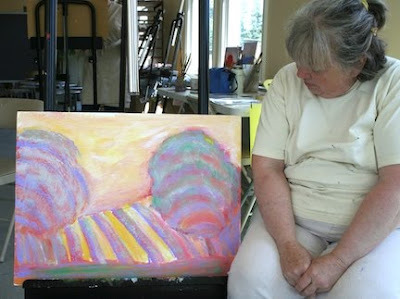 Her work is inspired by the sea and the English coastline. Notice the layering, the sense of depth and space she creates, all within simplified, abstract compositions of absolute integrity. 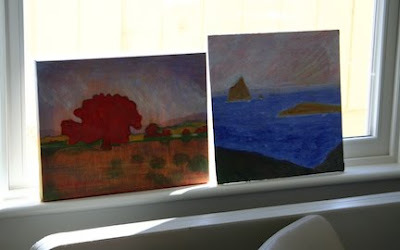 My favorites among her current pieces are her Black, Coast, and Lake Michigan series, but the smaller works are also lovely. 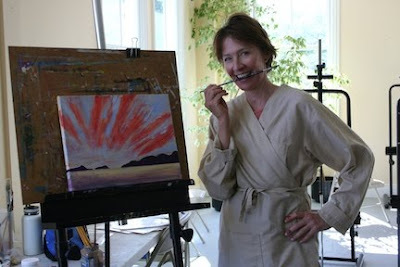 I hope you'll take a look at her work – and take inspiration in what you see. 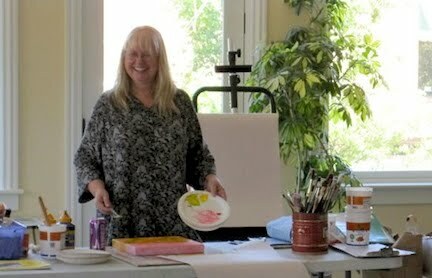 Tomorrow I'll be demonstrating painting and soft block printing at the Napa County Fair, here in Calistoga, from noon to 4:00. I'm looking forward to it! It'll be hot, but I'll be inside, in the Butler Pavilion (where the art is – and where it's cool). Here's a link to the Weekly Calistogan's article about the fair and Sunday's parade. And here's a link to the Calistoga Tribune's front page, with photos of the fair and parade.